The presidential campaign of eighteen twenty-eight was bitter and vicious, full of angry words and accusations. The old Republican Party of Thomas Jefferson, James Madison and James Monroe had split into two opposing groups. 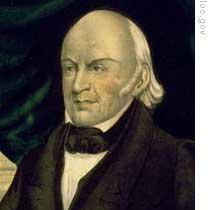 One group was led by President John Quincy Adams and Secretary of State Henry Clay. It called itself the National Republican Party. The other group was led by General Andrew Jackson. It called itself the Democratic Party. This week in our series, Sarah Long and Steve Ember talk about the election of eighteen twenty-eight. Each party had its own newspapers. In Washington, the Daily National Journal supported President Adams. The United States Telegraph supported General Jackson. The Telegraph published charges against the administration made by congressional Democrats. The Journal, in turn, published a pamphlet that had been used against Jackson earlier. Among other things, the pamphlet charged that Jackson had fought a man, chased him away like a dog, and then took his wife. The charge was not true. This is the story. It is important, because it had a great effect on Andrew Jackson for the rest of his life. Jackson met the young woman, Rachel, at her mother's home near Nashville, Tennessee. At the time, Rachel and her husband, Lewis Robards, were living there. They were having marriage problems. Robards argued with his wife about Jackson. He said she and Jackson seemed too close. Jackson was advised to leave, and he agreed to go. Before he left, he met with Robards. Robards reportedly wanted to fight Jackson with his fists. Jackson refused to fist-fight. But, he said he would face Robards in a duel, if Robards wished to fight like a gentleman. Robards rejected the invitation, and nothing more happened between the two men. Jackson left. Robards and Rachel settled their differences. She went back to their home in Kentucky, but did not stay long. They had another dispute, and she left. Court records say she left with a man -- Andrew Jackson. Rachel's family had heard how unhappy she was with Robards, and had asked Jackson to bring her back to Tennessee. Robards followed them. Rachel told him she wanted a divorce. Robards threatened her. He said he would carry her away by force if she did not go back to Kentucky. Rachel decided to flee. She would go with some traders to Natchez, in the Mississippi territory. It would be a dangerous trip down the Cumberland, Ohio, and Mississippi rivers. Jackson was troubled. He felt badly, because he had been the cause of Rachel's unhappiness. By now, Rachel meant much to Jackson. He had fallen in love with her. When the traders asked him to go to Natchez, he agreed. The group left early in seventeen ninety-one. A few weeks earlier, Lewis Robards had begun preparations for a divorce. He did not complete the necessary action, however. Yet he led Rachel's family to believe that he had. That the two of them were no longer married. Jackson returned to Nashville after several months. He asked for permission to marry Rachel, now that she was free of Robards. Rachel's mother gave her permission. Andrew Jackson and Rachel were married in August seventeen-ninety-one. Both were twenty-four years old. They remained in Tennessee. The next two years were busy ones for Jackson. As a young lawyer, he worked hard and traveled far. In December, seventeen ninety-three, he discovered court papers showing that Lewis Robards had only recently divorced Rachel. This meant that at the time Jackson and Rachel were married, she was still legally married to Robards. Jackson was shocked. As soon as possible, he and Rachel were married again -- legally this time. Almost ten years passed. Jackson was a judge and took part in Tennessee politics. One day, Jackson met the state's governor outside the court house in Knoxville. The governor was telling a large crowd about his great services to the state. Jackson felt it necessary to say that he, too, had done some public services. "Services," shouted the governor. "I know of no great service you have done the country except taking a trip to Natchez with another man's wife!" Jackson's eyes grew as cold as ice. The governor pulled his sword. "Great God!" cried Jackson. "Do you speak her sacred name." He jumped at the governor with a stick. The two men were separated. A few years later, Jackson killed a man in a duel, after the other man made a joke -- while drunk -- about Jackson's marriage. As a candidate for president, Jackson could not take to the dueling field to defend his wife's honor. He wanted to. But he knew it would prevent him from being elected. Jackson asked a special committee of citizens to investigate his marriage and make a public report. The committee found that Jackson and Rachel got married only after they believed her first husband had divorced her. As soon as the mistake was discovered, they were married again, legally. The report said they were not at fault. 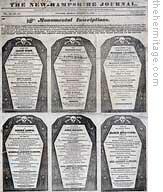 One of the 'coffin hand bills' published to attack Andrew Jackson during his presidential campaign. The coffins represent the deaths Jackson's critics believed he caused during his military campaigns. The pro-Jackson newspaper in Washington published the committee's report. But anti-Jackson newspapers did not. They insulted him and his wife. General Jackson struggled to control his anger. "How hard it is," he said, "to keep myself away from these villains. I have made many sacrifices for my country. But being unable to punish those who lie about my wife is a sacrifice too great to bear." Anti-Jackson newspapers continued to print vicious lies about him. And the pro-Jackson newspapers began to print vicious lies about President Adams and his wife. All during the bitter campaign, neither candidate said anything about one very important issue: slavery. Adams did not want to lose what little support he had in the South and West by denouncing slavery. Jackson did not want to lose the support of some Republicans in the North by openly defending it. Adams's silence did not mean that he approved of slavery. Southerners were sure that he opposed it. And Jackson did not have to tell the South what he thought about slavery. He was a slave owner, and had bought and sold slaves all his life. There was another important difference between the two men and their political parties. President Adams and the Republicans represented the interests of those who owned property. Many of the president's supporters felt that wealthy, property-owning citizens should control the government. They feared popular rule, or government elected by all the people. Jackson and the Democrats represented the interests of common men. They did not feel that the rich had more right to govern than the poor. They believed in the democratic right of all men to share equally in the government. The election was held in different states on different days between October thirty-first and November fifth, eighteen-twenty-eight. In two states -- South Carolina and Delaware -- the legislature chose the presidential electors. In all the other states, the electors were chosen by the voters. When the electoral votes were counted, Jackson received one hundred seventy-eight. Adams received only eighty-three. It was a great victory for Jackson. His wife, however, was troubled. She was a simple, kind woman who loved her husband. "For Mr. Jackson's sake," she wrote, "I am glad. For my own part, I never wished it." She knew, of course, of the charges made during the campaign about their marriage. Her courage supported her. But when the excitement of the election had ended, she lost her energy. And her health became worse. 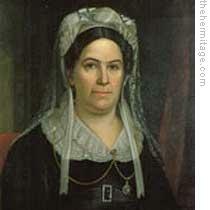 Someone proposed that Rachel Jackson stay in Tennessee until her health became better. Then she could join her husband at the White House in Washington. Rachel did not want to go to Washington. But she felt that her place was with her husband. That will be our story next week. Our program was written by Frank Beardsley. The narrators were Sarah Long and Steve Ember. Transcripts, MP3s and podcasts of our programs are online, along with historical images, at voaspecialenglish.com. Join us again next week for THE MAKING OF A NATION - an American history series in VOA Special English. generally speaking, the affair between man and woman is a deadly harm to a person involved. 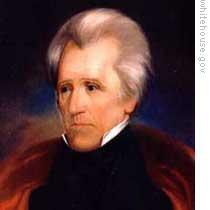 but Jackson earned the victory in the eighteen twenty eighth's presidential election. maybe he had done a good job. I think Jackson was a strong man.